There is good reason why ‘The Shape of Water’ has 13 Oscar nominations, including Best Picture. 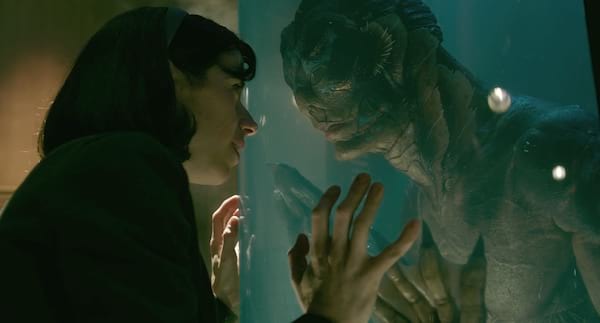 Director and co-writer Guillermo del Toro returns to the same tone and mood of his previous Oscar nomination when he was nominated for Original Screenplay for ‘Pan’s Labyrinth.’ ‘The Shape of Water’ is equal parts fantasy and horror, a brilliant interplay between the whimsical world where an amphibious being exists side-by-side with the real horrors that lie within a human being’s heart. 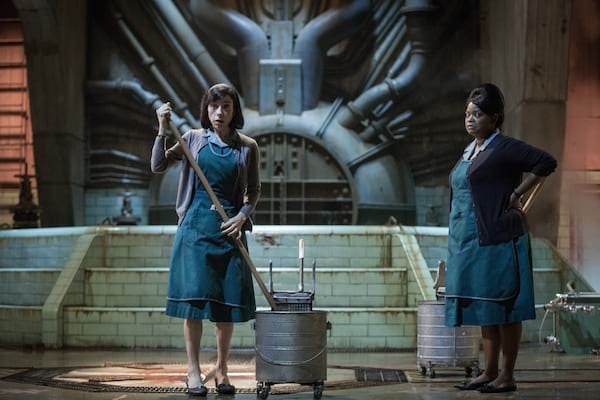 Set in the 60s, ‘The Shape of Water’ follows the story of the mute cleaning lady, Elisa Esposito, a sweet and dreamy girl who happens upon an extraordinary aquatic creature in the underground government facility where she works. Her natural curiosity and tender nature immediately bonds her with the amphibian man, who she manages to communicate with through sign language. Standing in her way is Richard Strickland, who brought the amphibian man to the facility and has authority to torture him and decide his fate. 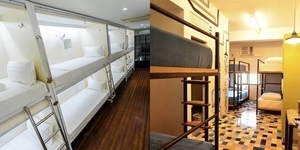 Del Toro designed this world somewhere between steampunk and dieselpunk. The technology in the facility is large and clunky, but there is a heavy-hand of pulp fiction and noir sensibilities, especially when the scenes are played out in Elisa’s home and on the streets. Everything is dark but every shiny object glows, reflecting lights off of light sources. It really creates this world in the midst of the cold war between America and Russia, but there is magic here. 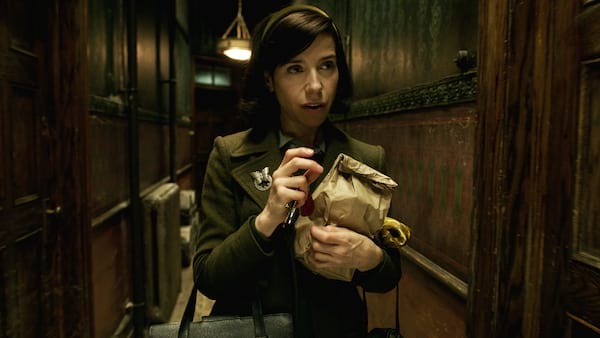 But more than the appearance of an amphibian man, the true magic of ‘The Shape of Water’ comes from Sally Hawkins who plays Elisa. Hawkins, without any dialogue, manages to make Elisa an expressive, powerful spirit. She exudes the character’s innocence and tenderness. Without words, Hawkins brings us into Elisa’s thoughts and hides nothing from us. In a pivotal scene, she signs with such emotion that Richard Jenkins, playing her neighbor Giles, practically doesn’t need to say what she’s signing. We know. We feel it. The whole context of it. Jenkins and Octavia Spencer, who plays Elisa’s co-worker Zelda, completes the heart of ‘The Shape of Water.’ Elisa is mute. Zelda is a colored woman. Giles is a gay man. The political statement of these three characters and how these minorities were treated in the 60s is very evident and plays strongly in the undercurrents of the film. In fact, even the amphibian man (played by Doug Jones) becomes part of this circle of the marginalized and mistreated. This is where Michael Shannon showcases his exemplary portrayal of Richard Strickland, who becomes a sort of symbol of everything that’s wrong with the world today. Strickland is an arrogant brute, who thinks he is better than everybody else around him. But what makes him dangerous is he honestly believes that he is in the right. This is Shannon’s brilliance because he makes Strickland recognizable and familiar. He makes him very human, which makes his monstrousness so repulsive. And it is in that twist that ‘The Shape of Water’ becomes more than just a whimsical love story of a mute girl and an amphibian. Set in the cold war of the 60s, it shows the evils of self-righteousness and arrogance. It emphasizes the horrors that one can find excuses for in times of war and fear. As much as it plays out like a fairy tale, ‘The Shape of Water’ reminds us that in fairy tales there are monsters and they are among us, oftentimes, the people who say they are out to protect us. 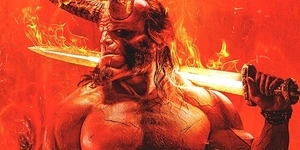 Del Toro’s beautiful movie shows us a world that is both full of love and full of hate, living side-by-side, and it’s a magnificent juggling act with all these themes flying in the air all the way until the final scene. It would be wonderful if Sally Hawkins would win the Oscar, but she’s up against serious competition. Best Director is a fight between Del Toro and Christopher Nolan (for Dunkirk), but Del Toro has been winning and rightly so. And while it would be wonderful for ‘The Shape of Water’ to win Best Picture, the Academy Awards has not been kind to fantasy films. And that is a shame, because ‘The Shape of Water’ is more than just a cinematic fairy tale. It is so much more than that.